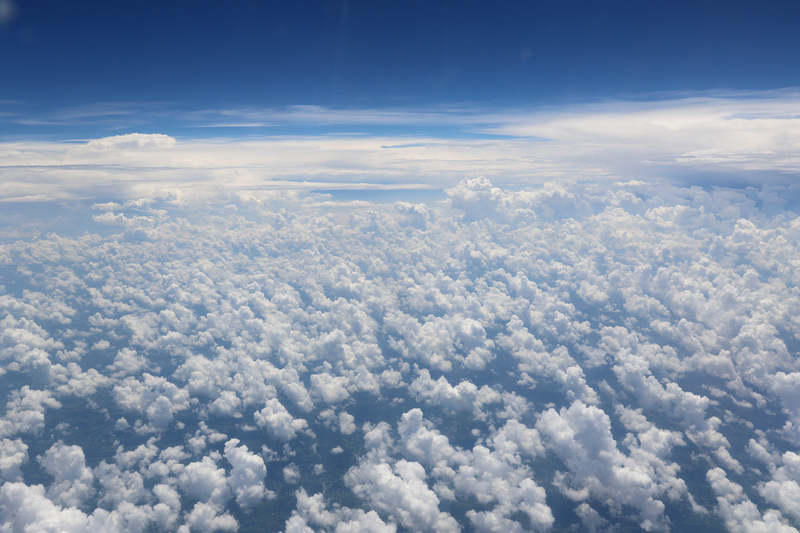 On Friday, July 29, Sean and I took an 11:49am flight from Chicago, which landed at 2:38pm in Charlottesville, Virginia. Charlottesville, in the Virginia Piedmont east of the Blue Ridge Mountains, is both the home of Thomas Jefferson’s University of Virginia and the gateway city to Shenandoah National Park. 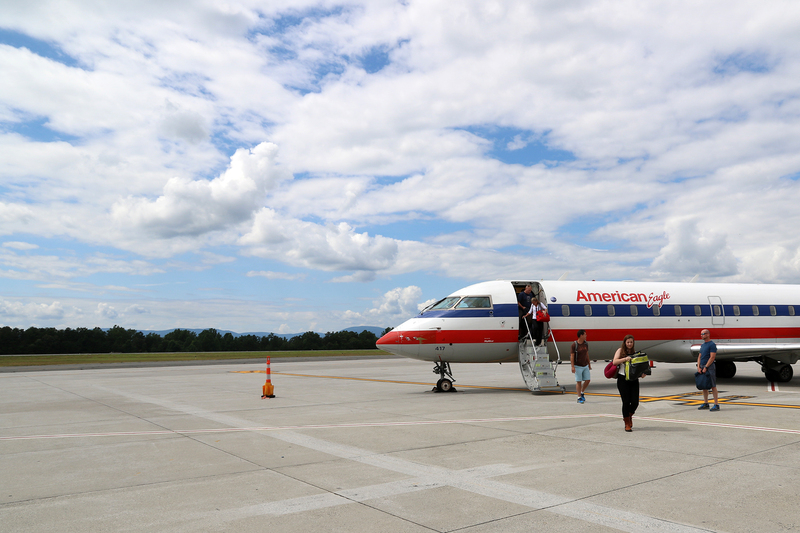 We had chosen Charlottesville rather than one of the Washington, D.C. airports because it was closer to the heart of the Park, less busy than D.C., and had comparatively inexpensive flights. 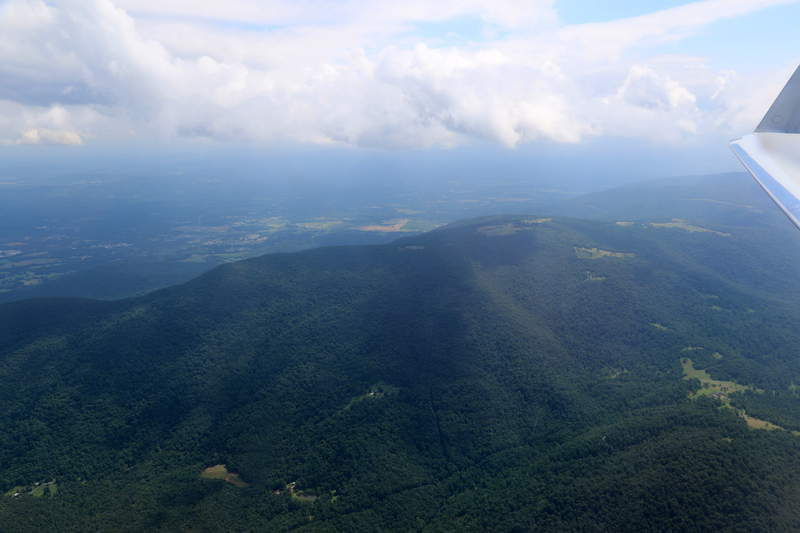 As a bonus, our approach to Charlottesville took us directly over Shenandoah National Park, with glimpses of Shenandoah Valley and the Virginia Piedmont on either side. 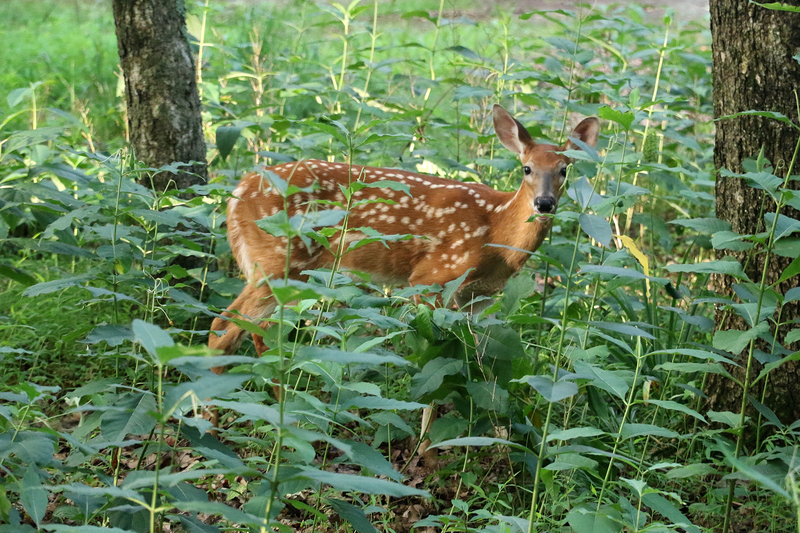 Shenandoah National Park protects an over-one hundred mile-long stretch of the backbone of the Blue Ridge Mountains in Virginia. 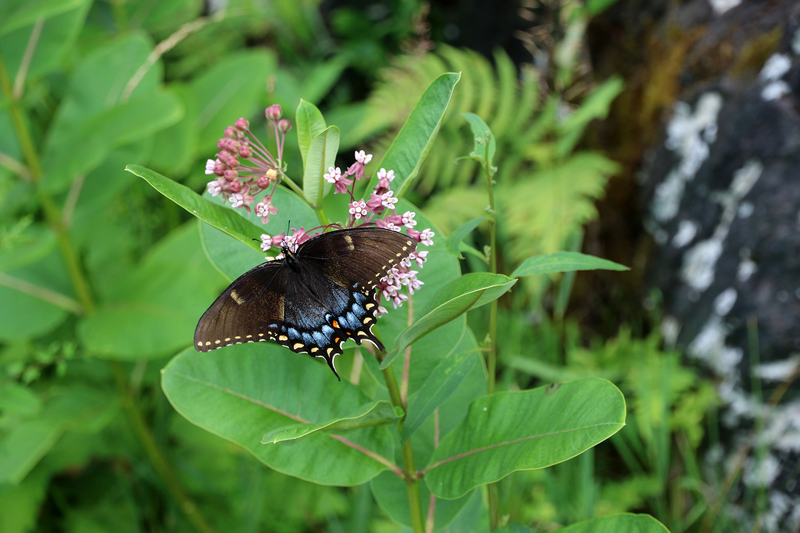 It is one of two National Parks authorized and established in the southern Appalachian Mountains in the first half of the twentieth century. The other is Great Smoky Mountains National Park, which is linked to Shenandoah National Park by the Blue Ridge Parkway. Within Shenandoah, the Blue Ridge Parkway is known as Skyline Drive, a celebrated scenic road that traces the entire length of the park, sometimes serving vistas of Shenandoah Valley to the west and at other times cresting the ridge to offer panoramic views of the Virginia Piedmont. 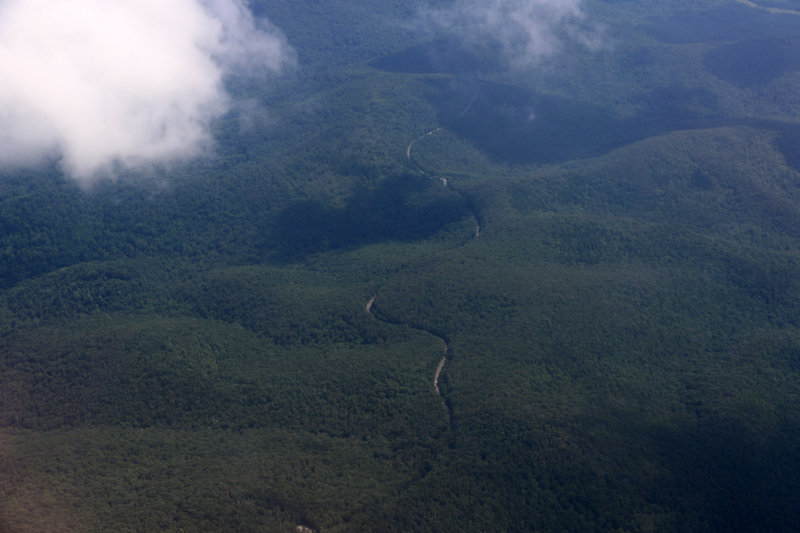 The Blue Ridge Mountains, long and narrow, stretch from southern Pennsylvania into northern Georgia. 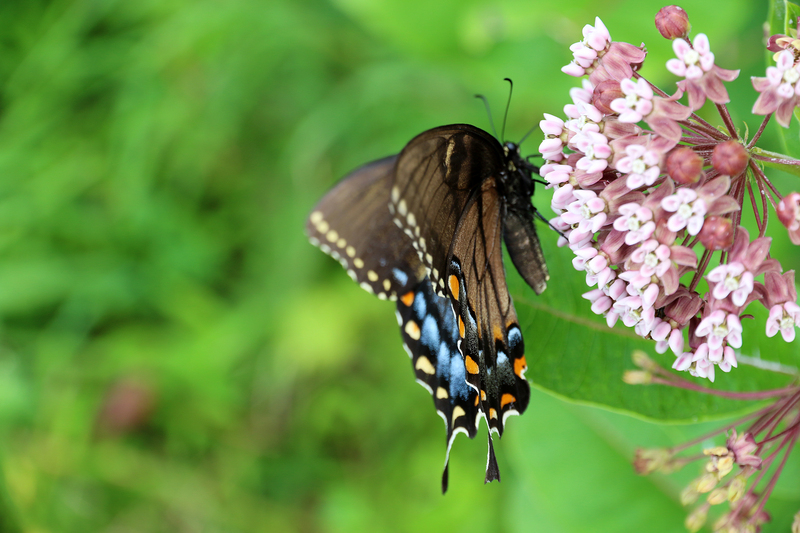 They form the eastern portion of the southern Appalachians, and it is the Blue Ridge Mountains that the Appalachian Trail traces in its southern sections. 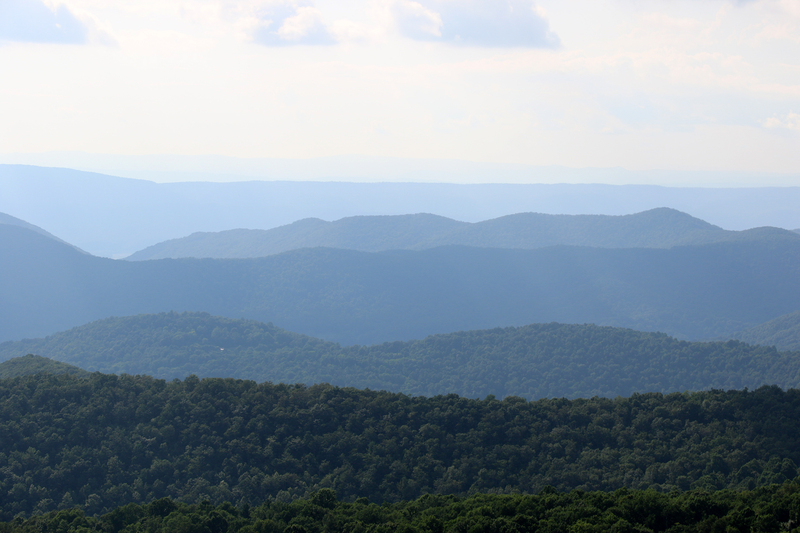 The Blue Ridge is separated from the ridges and plateaus to the west by the Great Appalachian Valley. The valley stretches from Lake Champlain (separating the Green Mountains from the Adirondacks) all the way into Alabama. 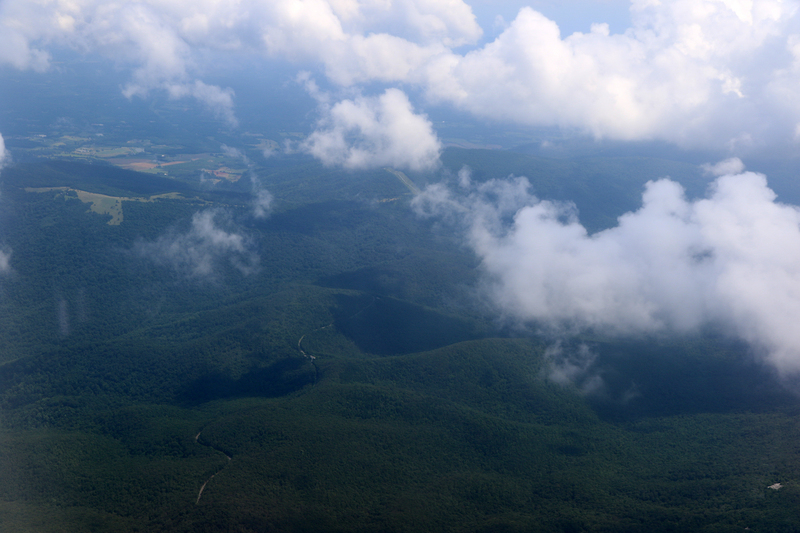 Along the way, it encompasses such famous valleys as the Hudson River Valley, Shenandoah Valley, Cumberland Valley, and the Tennessee Valley. 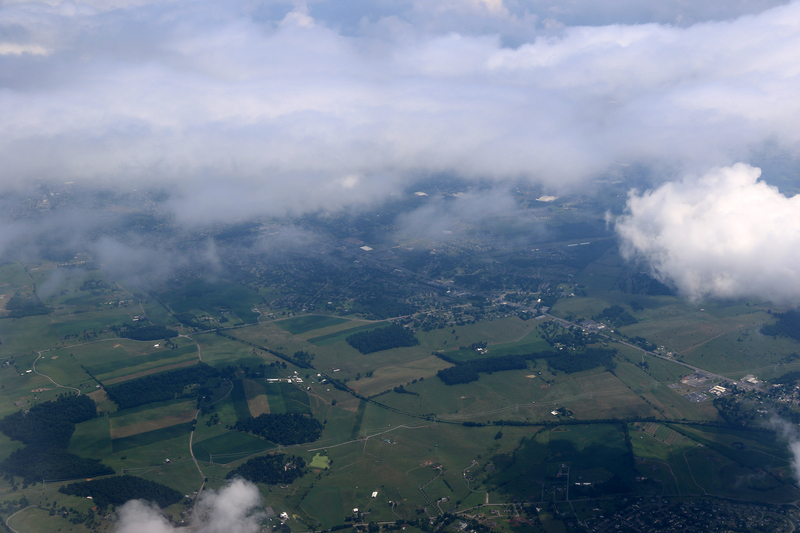 Our flight’s final descent was over the rolling hills and tidy farms of the Virginia Piedmont, sloping gently toward the Atlantic coast. 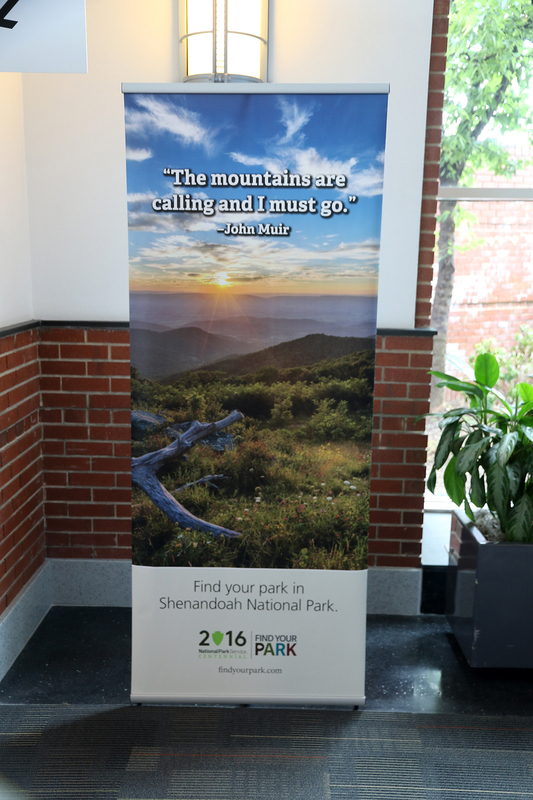 Charlottesville airport is small enough that we disembarked the plane on the tarmac and sauntered into the main terminal building, where a “Find Your Park” poster of Shenandoah greeted travelers. 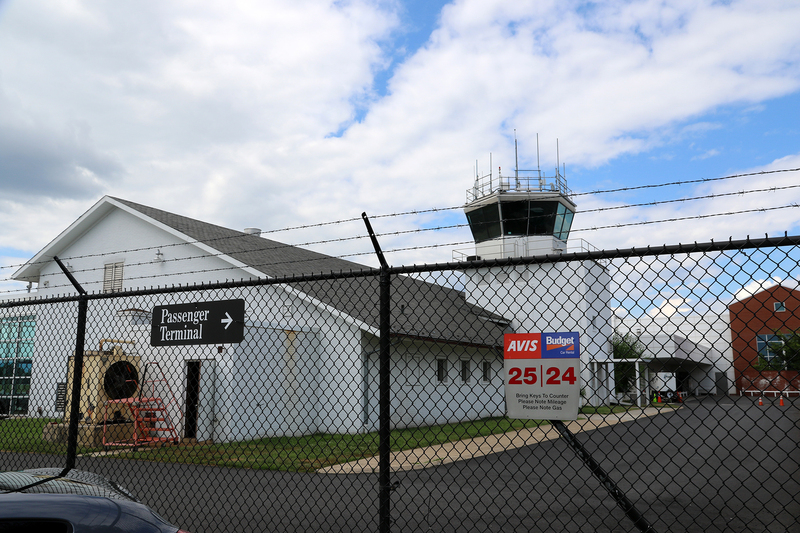 As we were walking to the rental car lot, Sean remarked that the airport looked like the Platonic ideal of an airport or the way that an airport would be rendered in a children’s book. We headed south to the outskirts of Charlottesville, where we stopped at a Whole Foods to pick up fresh food for the weekend. We were traveling light since Bethany had taken our gear, everything from the things we usually traveled with like our packs and tent to the supplies we usually had to pick up on the ground like camp stove fuel. Since she had driven from Chicago earlier in the month and would be returning to Chicago before our next trip in September, it worked out perfectly. After Whole Foods, DJ Sean turned on Fleet Foxes’ “Blue Ridge Mountains,” and we headed north. 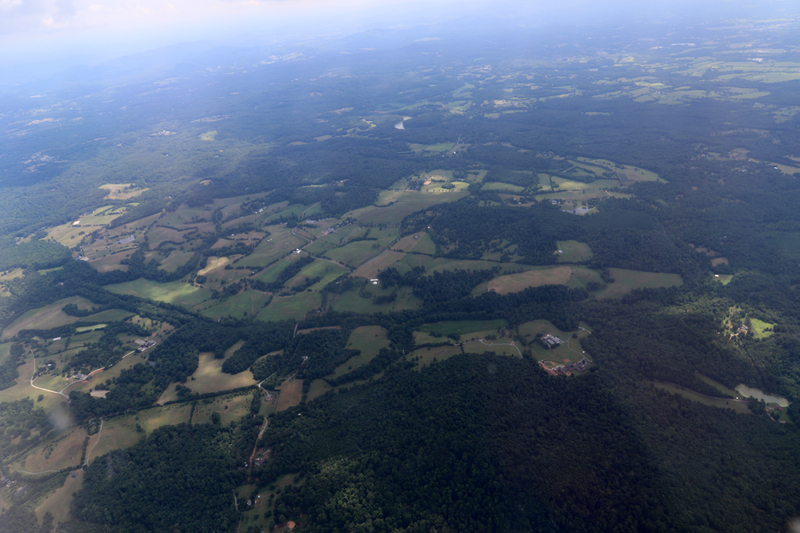 The landscape, even in Charlottesville, was lush and green at the height of summer. 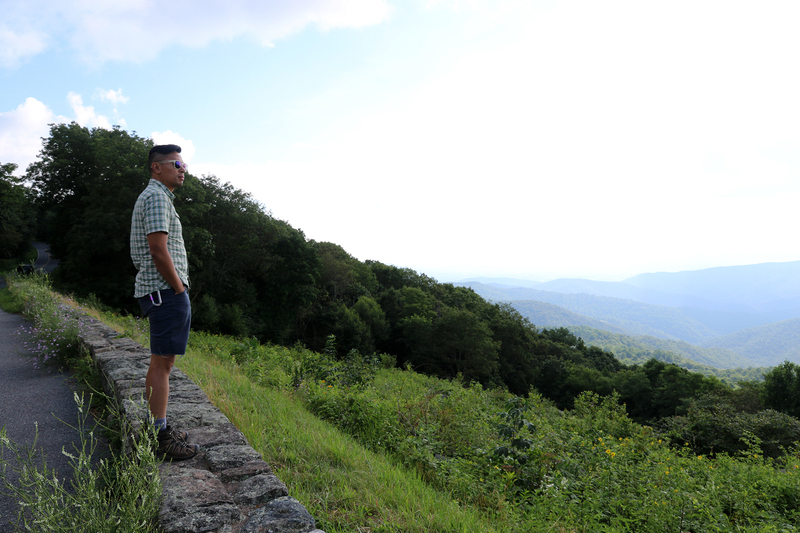 I thought of my friend and former intern, Kirk, who had just started a masters program at UVA, and that at least for access to nature, Charlottesville was quite nice. 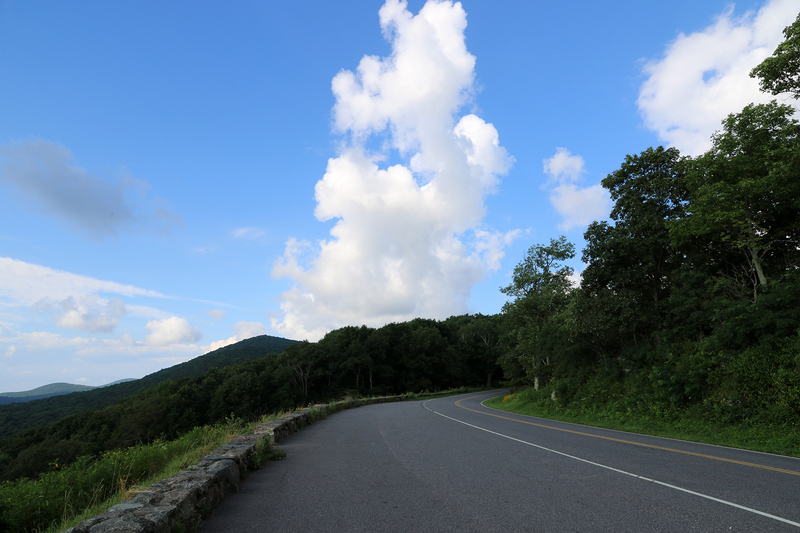 We entered Shenandoah National Park from the east at the Swift Run Gap Entrance, about a third of the way north from the Park’s southern terminus. 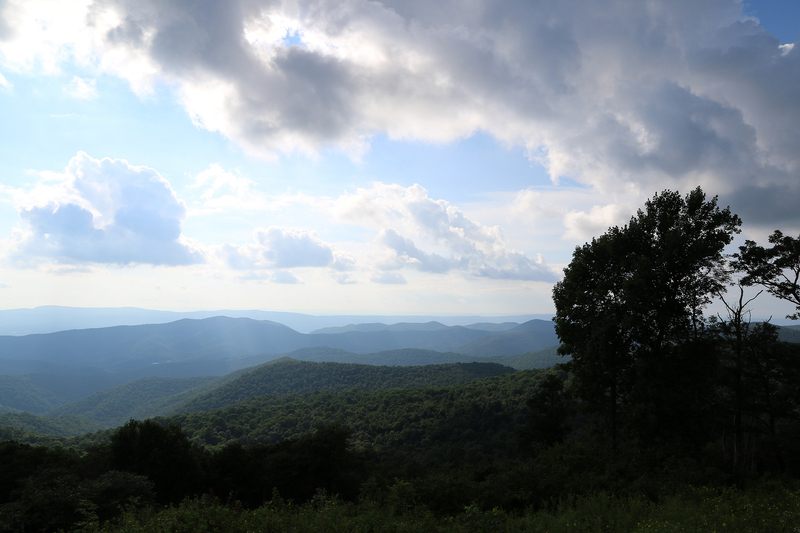 The main entrances are at the southern and northern ends of Skyline Drive and then at two east-west highways that intersect Skyline Drive. On my brief previous visit, we’d entered the Park at the south entrance and driven as far north as Swift Run Gap before continuing west. So right from the start, I was seeing parts of the Park I’d not seen before. 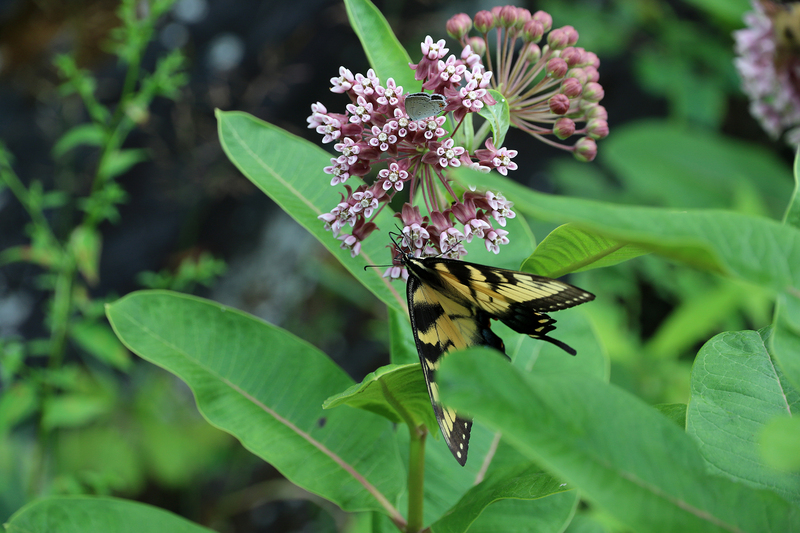 Sean asked the Ranger at the entrance station if it was busy and she replied that no, it was very light for a summer Friday. The threat of rain from earlier in the day was apparently keeping people away. 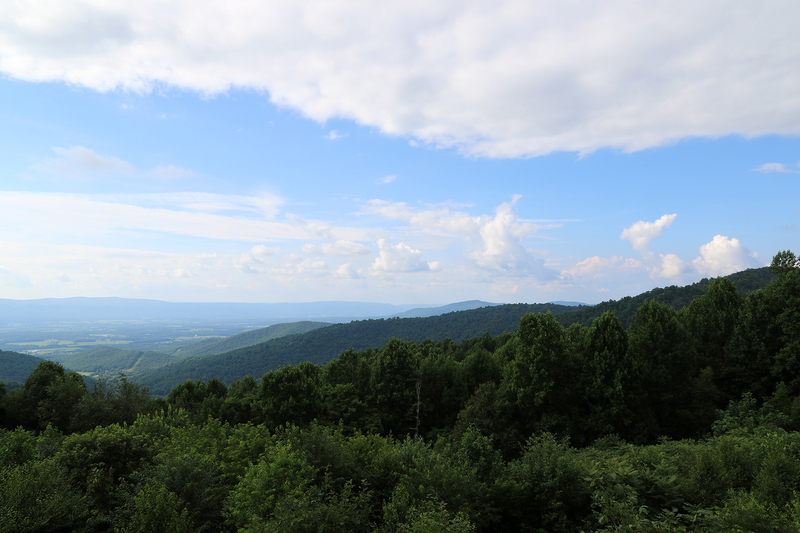 We turned north on Skyline Drive and pulled over at the very first overlook for our first Shenandoah National Park vista of Shenandoah Valley to the west. 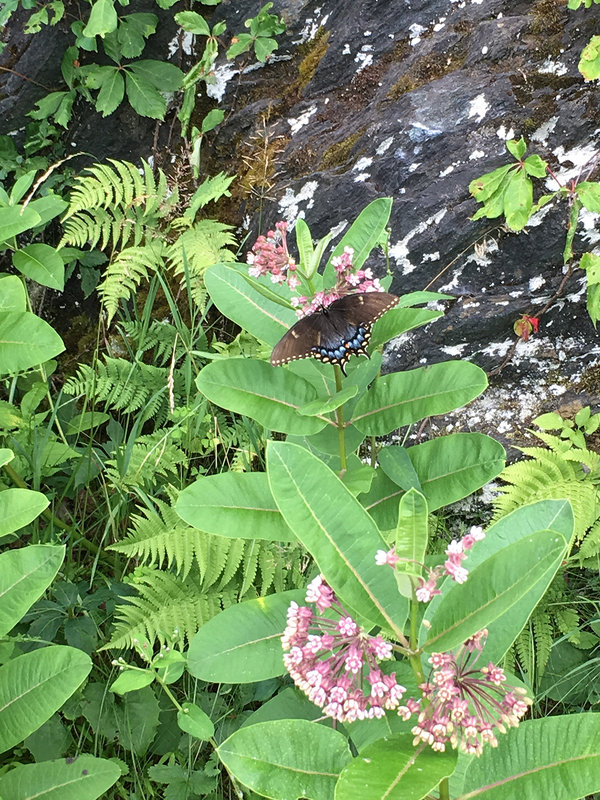 But even better than the view at that overlook was what we encountered across the drive where a mass of butterflies was feasting on nectar in a patch of Common Milkweed at the base of a rocky incline. 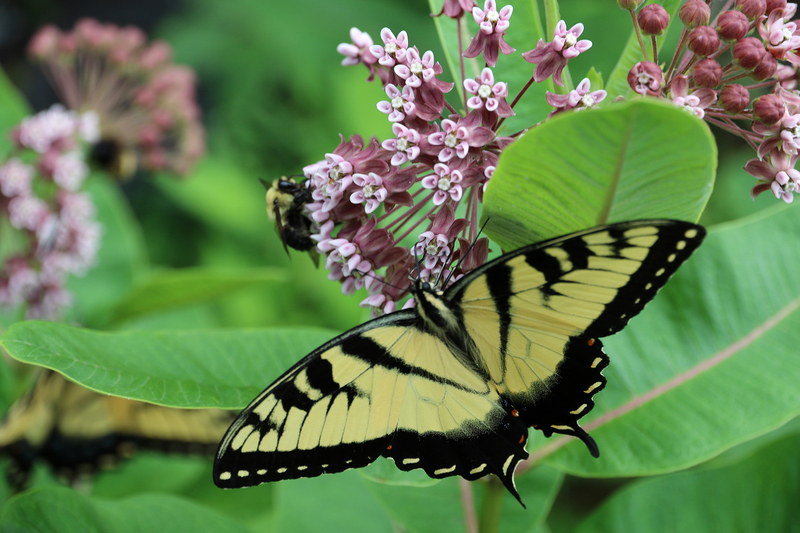 We were in high season for butterflies (particularly swallowtails) and saw them nearly constantly for the remainder of the weekend. 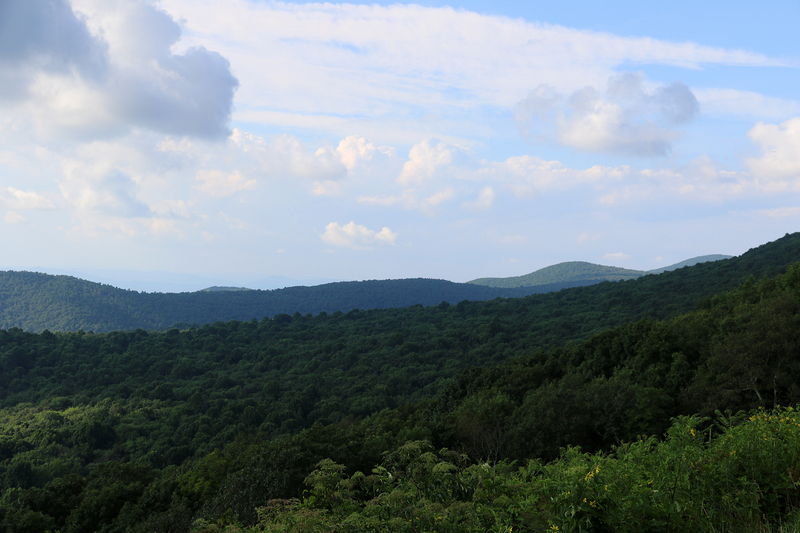 We continued north toward Big Meadows, stopping to take in the view at several overlooks along the way. 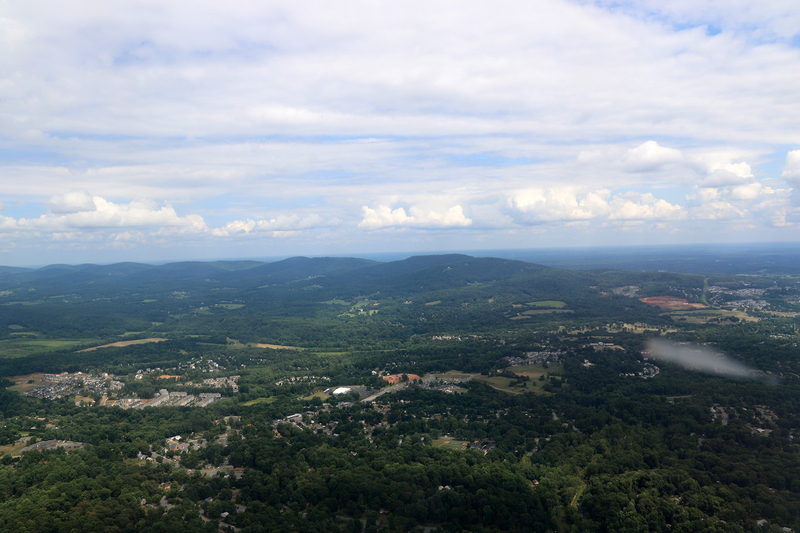 Skyline Drive was envisioned as the major tourist draw of the Park when it was authorized in the mid-1920s, and the Drive was constructed while the land for the Park was acquired through a combination of purchase and condemnation. Although the Civilian Conservation Corps (CCC) did not construct the road (it had already been carved and graded before the CCC was established in the wake of Franklin Delano Roosevelt’s election), the CCC was responsible for the picturesque walls that border the Drive and for the re-landscaping of the slopes and easements along the roadway, ensuring that the road blended as well as possible into the scenery. We spotted a groundhog along the road, but were not able to stop for a photo. 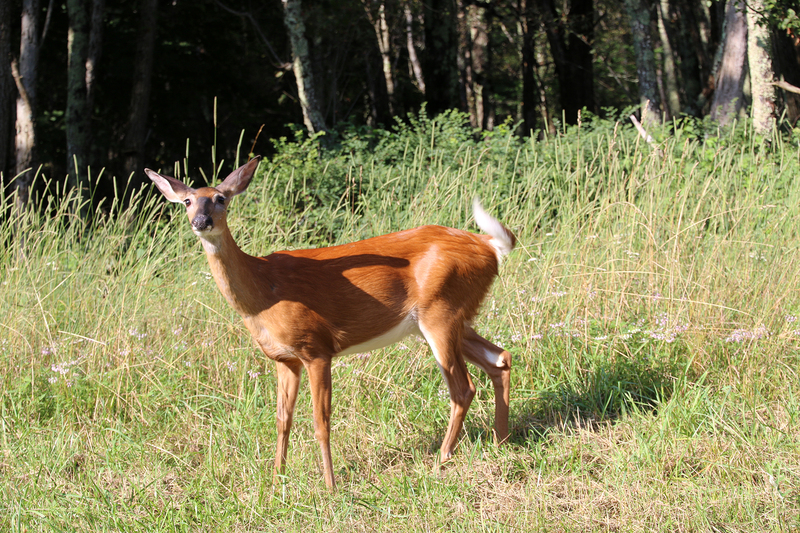 We were able to stop, however, for Sean to capture a shot of a beautiful Whitetail Deer. 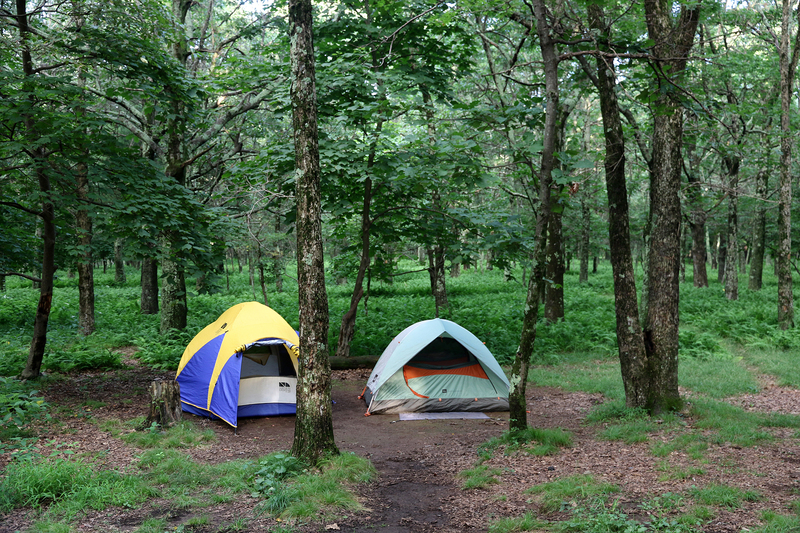 Soon we were at Big Meadows Campground near Byrd Visitor Center in the heart of Shenandoah National Park. Although the campground was full (with families, solo cyclists up for the night from D.C., and Baptist church van loads of shirtless young men) and was located at the biggest hub of activity in the Park, our site was secluded at the edge of the walk-in tent sites section of the campground. 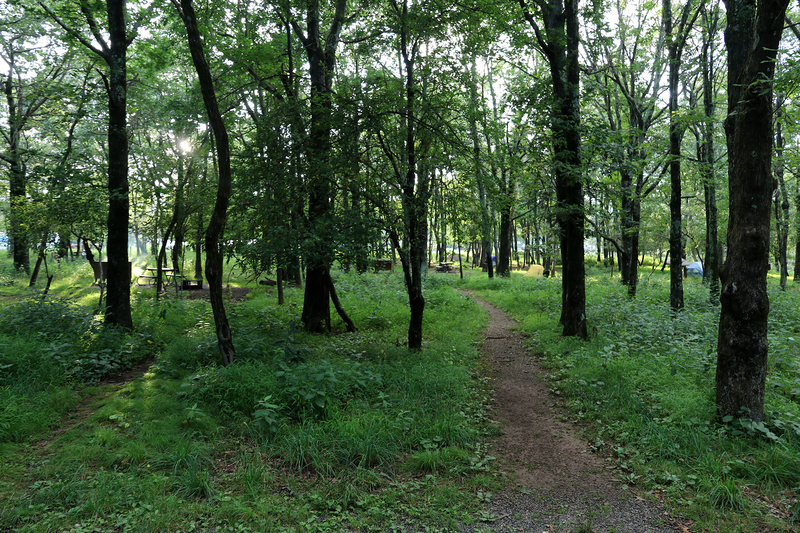 Beyond our tents was nothing but forest. Bethany had arrived about forty-five minutes before us and was busy unloading gear and setting up camp. Once we were settled, Sean and I went to get some firewood and use the toilets. I had left my camera and had told Bethany to take photos if anything interesting should happen. 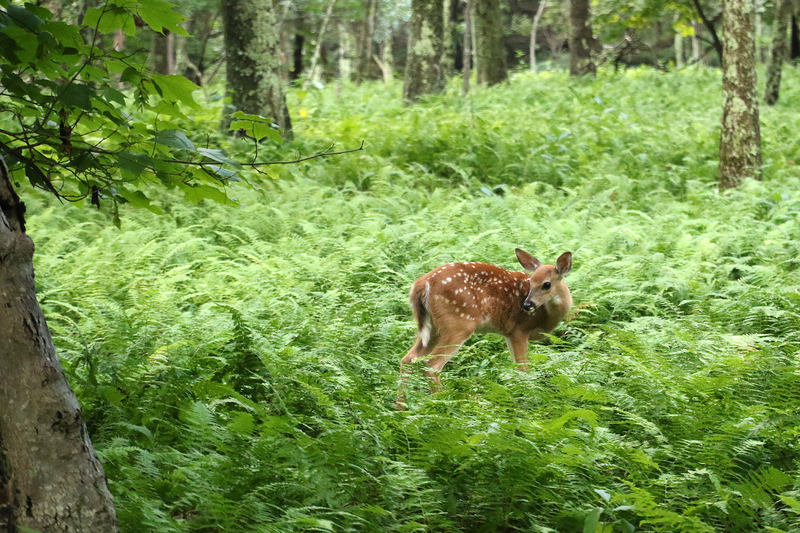 When we returned she was snapping away at a doe and two fawns browsing the ferny understory near our tents. 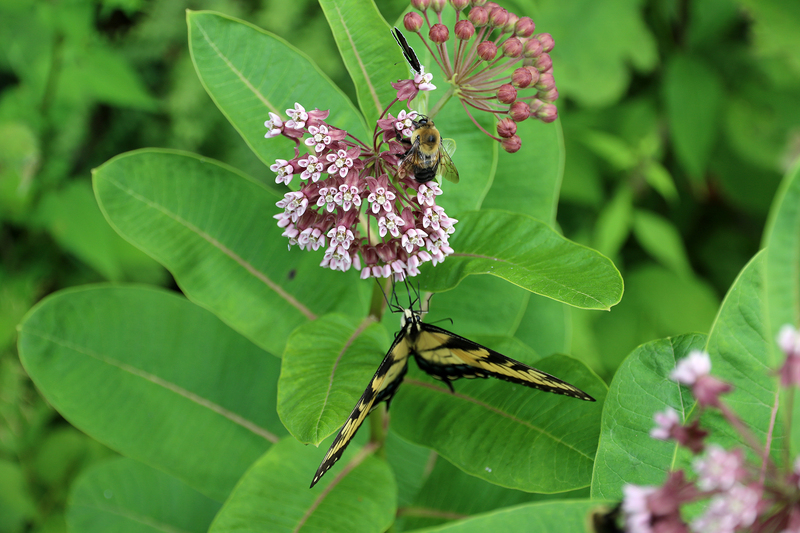 She handed me the camera, and I captured some images and video. By the time we had set up camp, we decided that there was too little daylight left for a decent hike. So we made the call to start a fire and begin to prep dinner while we relaxed in camp, chatting and planning our hikes for the next day. 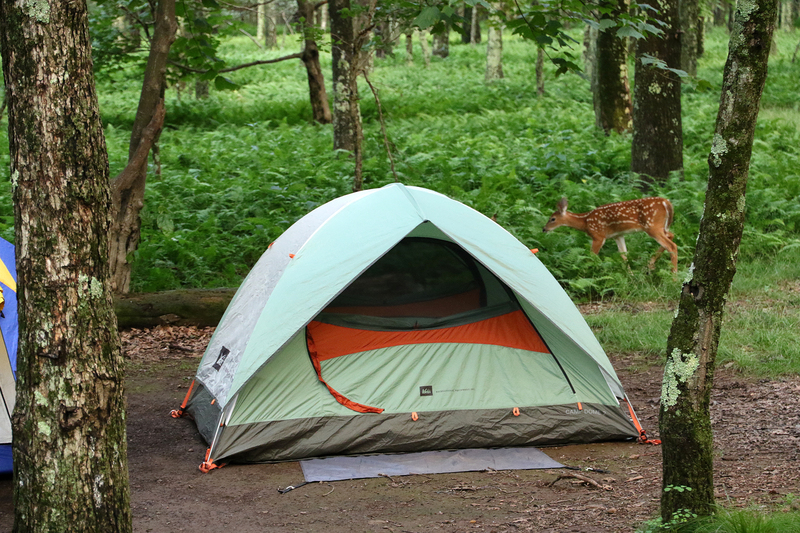 More deer wandered through the campground, at least eight different individuals just going about their evening browsing absolutely unconcerned about the humans who were also having their dinners. Our dinner was bison burgers with s’mores for dessert. 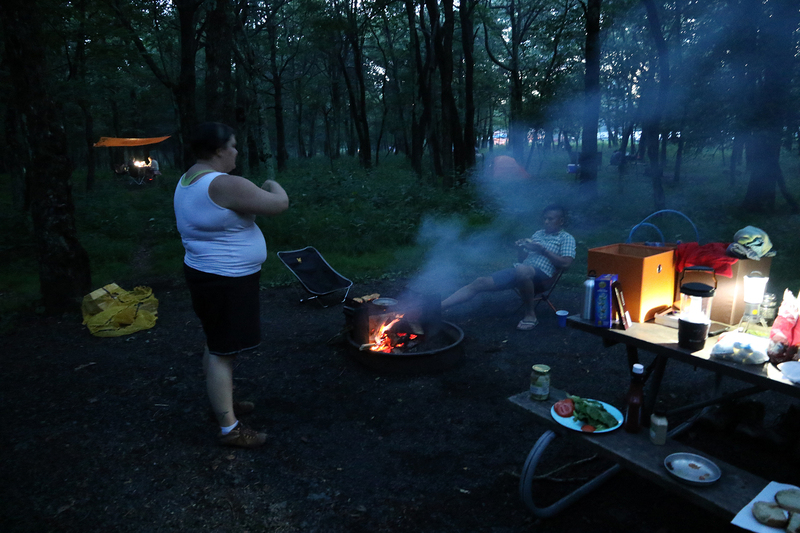 Afterward, we sipped wine and enjoyed our campfire and a quiet evening before bed. In the thick darkness before turning in, Sean had gone off to use the restroom and bruch his teen while Bethany and I were making sure everything was secure for the night in the bear box. 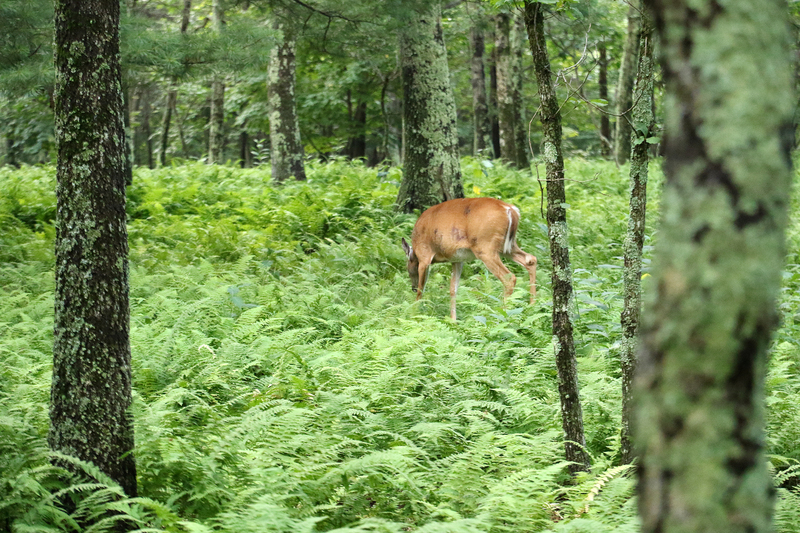 Suddenly, I heard something rustling in the underbrush near our campsite. I looked up with my headlamp and caught two glowing eyes quickly approaching. It was a Racoon, walking up like it owned the place. We were standing in front of the open doors of the bear box, so we quickly slammed them shut and the disappointed Racoon scurried away. This entry was posted in Journey and tagged Camping, Shenandoah, Virginia on January 19, 2017 by Brandon Hayes.